Browse > Home / Featured News / How Was Hostens Data Center Born? 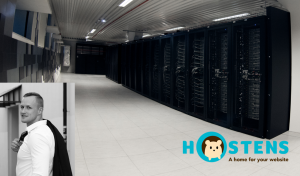 In this special interview with the Head of Hostens data center Engineering we’re going to discover how Hostens data center was born and what the main challenges as well as lessons learned while building and starting to run one of the most modern data centers in the Baltic region were. Vytautas Skirius, the lead person of Hostens data center, is one of those who spend most of their time at the data center. He knows all its corners so well as if it was his own home. He ensures the stability, integrity, and efficiency of all information systems operations and leads data center engineering projects. Today he agreed to share his know-how and experience with us. Give us a short overview of how everything started. When was the decision to build company’s own data center made? How did the whole process of setting it up look like? How did facilities, premises, etc. have to be prepared for a DC? When business is on the fast track and is experiencing growth, the company often finds itself in need of additional storage space for the data. That was the case with Hostens, too. Although we had good partners, in regards to the growing number of customers and increasing infrastructure requirements, we decided to build our own data center. The whole process took approximately 2 years and started with a strategic step to choose location for the data center. In this case, choosing the right location wasn’t the same as finding premises for, let’s say, office space. The potential location had to fulfil not only such ordinary needs as geographical location, availability or parking options, but also meet really high infrastructure and security requirements. Eventually, we had to connect all the systems, elements, and parts of the whole infrastructure in order to operate smoothly and serve a common purpose. It’s like all body systems working together to keep a human alive. Actually, that was quite a challenge. Finally, Hostens data center opened on December 15th, 2015. Do you remember the day when the first servers were implemented here at the data center? What was the feeling like? Sure, I can even show you where those particular servers are placed right now. In general, as I remember, the first server setup was a really significant moment. All our team member could clearly understand that it marked the new beginning of providing a top-level service. Tell us a bit about Hostens data center. The most important part to talk about is its features. So, first of all, Hostens data center is set up according to TIER III level. It means that we offer 99.98% availability. We run the most modern data center in the Baltic region. It is also one of the biggest ones. Currently, 139 server racks are securely housed at the site. The data center has an ecological and energy efficient new generation “free cooling” system installed. This system takes air from the outside and adapts the temperature and humidity to suit the equipment. No water is used for cooling, so there is absolutely no risk of a leak. Also, we pay great attention to fire prevention. Our aspiration smoke detection system with a highly sensitivity range (from 0.001% to 20% obscuration/m) is made to detect smoke even at very low concentrations over an area of 2000 m2. For example, if the system detects a burning wire, it immediately provides us with an early warning by pinpointing to the source of that fire. It allows us to react and protect the data center against any possible danger even before the fire has started. Finally, I would like to highlight the access control. As our data center has an iris recognition option, there is no doubt that it adds an additional layer of protection. Iris recognition is used to authenticate employee or customer identity prior to them entering the site by unlocking facilities with a simple glance. What is your favourite feature at Hostens Data Center? Without any doubt, it is the cooling system. What were the main challenges in developing this data center? For sure, building a new data center always brings multiple challenges. Talking about the very beginning, finding the right location was the main issue. We had to find the best and the most suitable location for the facility. I remember all those months of analysis and evaluation very well. Also, other main factors that had to be considered were data center equipment and network infrastructure. It was a huge challenge to find systems that fully met our requirements. As I have already mentioned, all the systems are different, made by different manufacturers, designed for different loads, as well as different climatic conditions, but they all have to work together flawlessly. Data center managers must manage all of these processes, at the same time remain maximum efficient, and still meet strict deadlines. In fact, that was a tough challenge, but amazing lessons were learned. Are there any funny stories or interesting facts regarding the data center? To be honest, I cannot tell you any funny stories at all (laughing). Basically, everything is in such control, so well-estimated and secured, that there are no non-standard situations. Interesting facts? Oh, yes. Personally, I’m very interested in the fact that the building where our data center is set up has a special purpose property status. During the World War II, that building was a military factory. Therefore, its structure is of an exceptional strength. In general, our data center is designed as a secure “building in a building” with its own additional walls and ceiling as well as separate access. Now, when the data center is successfully running, tell us which things have to be considered when building a data center. What should organizations pay most attention to when developing a data center? It is necessary to evaluate how suitable the potential location of the data center is. There are a lot of things you need to keep in mind: performance characteristics, power availability, geographic issues, and climatic conditions. It is crucial to choose the right technologies for the data center. Before building the data center, you have to evaluate all technical possibilities to be able to choose the most suitable equipment. Strong project management. By implementing a project of such a huge scale and complexity, it’s almost impossible to avoid various mistakes. Therefore, it’s necessary to do your research first, have a clear plan with estimated budgets, deadlines, and precisely follow each stage of the project. Tell us about your technical expertise. I have more than 5 years’ experience in data center sector. At first, I commenced my career at another web hosting company here in Lithuania. This helped me to grow as an expert and gave me an opportunity to see how a data center was run from up close. This experience increased my enthusiasm to continue my career working at data centers. At that time exactly when could feel that I had reached the top of my career in this company, I was offered to move to Hostens parent company. I accepted this challenge and today I work here managing its data center.